แนะลูกค้าผู้ชมคอนเสิร์ต J-DNA X-Treme คอนเสิร์ตเกาหลี JBJ Fan Meeting ผู้ร่วมงานสัตว์เลี้ยง Pet Variety งานแสดงสินค้าโอทอป ซิตี้ 2017 รวมถึงผู้เข้าประชุม สัมมนา งานเลี้ยงสังสรรค์ งานรับปริญญา และงานแต่งงานซึ่งมากถึง 9 คู่ ได้เผื่อเวลาการเดินทาง พร้อมติดตามการรายงานจราจรอัพเดทผ่านโซเชียลมีเดีย หรือสอบถามศูนย์จราจรอิมแพ็ค โทร.0-2833-5445 ซึ่งพร้อมให้ข้อมูลและอำนวยความสะดวกลูกค้าตลอด 24 ชม. อิมแพ็ค จับมือ เทศบาลนครปากเกร็ด เตรียมจัดกิจกรรมการกุศล ซิกซ์ ฟีท รัน 2017 ครั้งแรกที่เชิญชวนผู้รักสุขภาพและผู้รักสุนัขกว่า 400 คน ร่วมจูงน้องหมาพามาวิ่ง ระยะทาง 3.6 กิโลเมตร ในวันอาทิตย์ที่ 26 พฤศจิกายน 2560 ณ สวนสมเด็จพระศรีนครินทร์ นนทบุรี โดยรายได้ส่วนหนึ่งจากการจำหน่ายบัตร จะมอบให้กับสำนักงานควบคุมสัตว์จรจัด ภายใต้โครงการ “1 บาท เพื่อเจ้าตูบที่หิวโหย” ผู้สนใจร่วมลุ้นร่วมเชียร์เป็นกำลังใจในการแข่งขันวิ่ง 6 ขาครั้งนี้ ได้ตั้งแต่เวลา 14.00-18.00 น. IMPACT, in collaboration with the Bangkok Mass Transit Authority (BMTA), will provide free shuttle buses to facilitate the travel of the people who wish to attend the royal cremation ceremony for His Majesty the late King Bhumibol Adulyadej during October 23-31, 2017, with IMPACT Lakeside designated as the pick-up/drop-off and parking venue. 20,000 bottles of drinking water and 5,000 snack boxes will also be provided for government agencies to be further distributed to people attending the ceremony across Nonthaburi. Those wishing to take a free ride and planning to travel in a group are suggested to make reservation in advance by calling 089-889-8140. (August 2017) With Mother’s Day approaching, IMPACT, as a leading provider of food and beverages and catering services and the operator of more than 25 leading restaurants, rolls out a wide range of special offers and promotions to let the whole family celebrate this special occasion and enjoy an exquisite meal together. The Portal Lifestyle Complex now officially open. Mr.Paul Kanjanapas, Managing Director of IMPACT Exhibition Management Co., Ltd. reveals that due to the growing demand of exhibition space and service, IMPACT has set aside a budget of 600 million baht for the 4-storey commercial building “The Portal Lifestyle Complex” to serve visitors, exhibitors and Muang Thong Thani residents. Team building activities have become highly prominent for companies across the world. Successful business leaders in today’s business environment realize the importance of good teamwork and incredible results that team buildings can yield, and they can come from many different forms. In general, team building events are fun, challenging, and useful for nurturing better teamwork, making everyone feel unified, and promoting team efficiency and engagement. IMPACT has reconfirmed being leader in food and catering services that meet international standard. IMPACT Bakery chef team won gold medal in a ‘Free Style Cake Decoration and Free Style Hot Dessert Competition’ at Makro HoReCa 2017 recently held at IMPACT Exhibition and Convention Center, Muang Thong Thani. The winning piece was created under the theme “Sufficiency Economy” which portrays the royal initiative on integrated farming and heartfelt stories of the Thai people expressing towards the late King Rama 9. 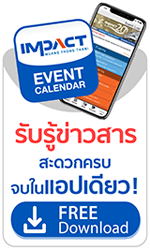 Bangkok, Thailand, May 2017 – INTERMAT ASEAN 2017, the Southeast Asian trade show for construction and infrastructure, is all set to open the doors on 8 June 2017 over a three-day show period, at Hall 3 – 4 and IMPACT Lakeside, IMPACT Exhibition & Convention Center, Bangkok, Thailand.